Filming on this story had begun in 2002 but with different figures. 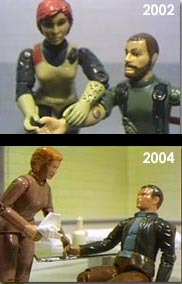 Michaels was originally Breaker (GI Joes) and Nurse Winters was Scarlet (GI Joes). The other soldiers used the same figures. 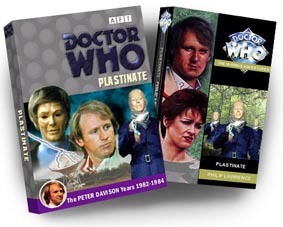 Plastinate was originally posted between April and June 2004. 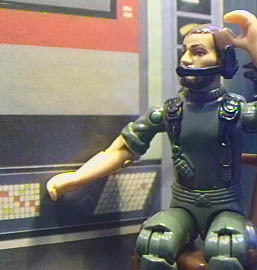 Two versions were made, one with Flash inserts for certain scenes. The other a regular AFT strip. The Flash version had a DVD cover while the regular cover is based on the Virgin 'missing adventures' style. At the time of it's original posting, the Autons were about to appear in the BBC Past Doctor novel "Synthespians TM". It had also been recently announced that the Autons would be returning in the opening adventure of the forthcoming New Series (still almost a year away). The Flash version included a DVD style homepage complete with extras. One special feature was The Making of the AFT which can still be viewed (in slightly updated form here). 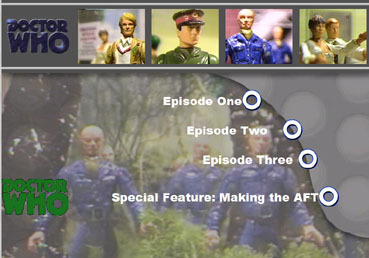 There was also a hidden 'easter egg' (shown left) which linked to a UNIT briefing on the Autons. You can see that here. The original story began life as "The Destructor Program", a Pertwee/ UNIT story where a man slowly transforms into an Auton. It was also considered as a Tom Baker story for a while too. Here are the original concept and draft storyline. The storyline bears more similarity to the finished story. Notice that Michaels began as Michael James. Years later, the Nestenes are facing a battle on another front and have to abandon the Earth invasion. Geoff is sent the cancellation signal along with news that he has been abandoned. Now trapped between his programmed role and the human life he remembers, Geoff decides to destroy the world. 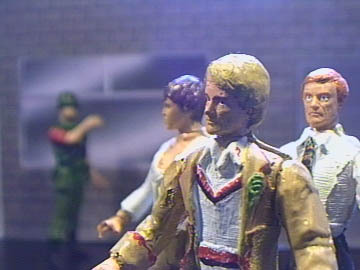 The Doctor investigates and is captured where he learns of Geoff’s plight and his plan. In the meantime, the Doctor himself is replaced by an Auton replica. When Geoff is seen in publicity, UNIT are able to bring in his wife to plead to his humanity. Will this work? I think we need to see Michael normal before anything happens. The TARDIS is bringing the Doctor and Sarah Jane back from another adventure when the Doctor detects a signal being beamed straight at Earth. The TARDIS is in its path and is buffeted with the Doctor and Sarah being thrown about. The radio telescope at night. Michael is sitting alone when suddenly the alarms sound. He picks up the signal but it is very fragmented. Trying to analyse it, he receives a kind of telepathic shock. The TARDIS has crashed and is dug out by UNIT. The Doctor is adamant that he and Sarah won’t be staying long but she is determined to stay long enough for a good night’s sleep and a shower. She heads off home. The Doctor asks the Brig to look into the signal and get in contact with radio tracking stations. Next morning, all but one of the tracking stations have reported no signal. The other station hasn’t responded at all. The Doctor plans to go there. Sarah arrives and meets with Benton who invites her out to dinner. Suddenly UNIT is called to a crime scene and Sarah surreptitiously follows. There is a murder victim. Michael watches from nearby as UNIT discover the body and take it away. When Sarah arrives, Michael kidnaps her. We could see Sarah in confinement or just see Benton at dinner waiting. I don’t think we should see Sarah and Michael talking yet. We could see Sarah in danger now? Michael’s wife, now fully plastic rises and tries to kill the Doctor before escaping. He gives chase but can’t keep up. When Benton arrives with news that Sarah Jane is missing the stakes are raised. The Doctor has no choice but to follow up his only lead and makes for the radio tracking station where he finds the logs for the previous night have been removed. He also learns that the person working here last night was the husband of the dead woman. Somehow they manage to find and rescue Sarah and learn that Michael has been inhabited by the Nestine consciousness. It will launch an all out offensive against UNIT including sending exploding Autons to dispurse plastic pollen. Through hypnotising Sarah (just for a change) the Nestene will have access to a bomb big enough to disperse the pollen into the atmosphere. A bomb? Or a space rocket? The Doctor will release Sarah from her hypnosis but it is too late. The autons have the silo guarded. They recce the place and then storm it using polymer viruses to chop down the guards. There has to be a lot of jeopardy and tension in the story. Will the Nestene succeed? Does the Doctor use Michael’s humanity to win the day? Either the rocket takes off but the Doctor is aboard and has a very few minutes to deactivate the explosives. Or the rocket takes off and explodes but the Doctor has removed the pollen from inside. Or destroyed it with fire. Is Michael actually being inhabited by a Nestine? Facing extinction, the Nestenes transmit their minds as a radio wave but only a small part of it gets through and enters Michael. The rest is lost, gone forever. It will slowly take him over. 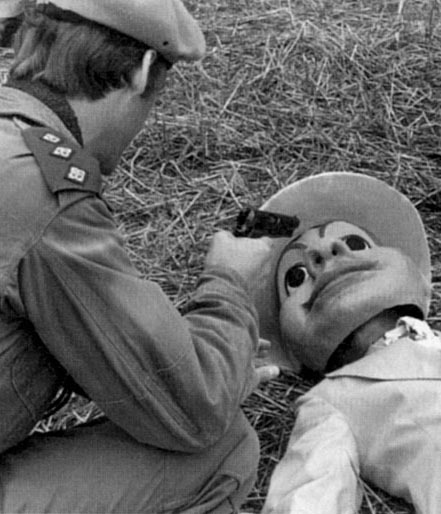 It wants revenge and will take it out on humanity by turning them all into Autons! 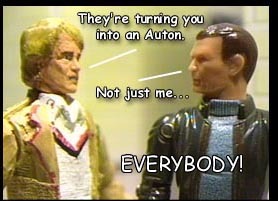 There will be more imaginitive Auton fighting. The Doctor can make a polymer virus that will break down great swathes of Auton soldiers. This story was a long time in the making. The original shoot began in 2002 with a different cast. The TARDIS scenes were filmed first and appear in the finished story. Some scenes in the army base were shot but abandoned when the story was recast for the 2004 shoot with superior sets. Plastinate was originally two episodes but when the flash scenes took so long it became obvious that the episodes wouldn't be completed on time so it was decided that part one would finish in the mortuary. The rest of the story was split in two with the cliffhanger of the Sergeant/Auton about to explode. The result was a slightly weaker third part that some found disappointing but in retrospect the story works a lot better in three parts. The original episode ending would have come where the Doctor confronts Michaels for the first time as shown. Whilst compiling this behind the scenes page, a lost scene was discovered. Originally from episode two, this short mortuary flash scene was never completed and therefor never posted. It has now been completed and we present it here. The AFT had been running for nearly three years and interest from the production point of view was beginning to wane and we were looking into ways of revitalising the format. One such was was to make the stories as Flash animations, bridging the gap between actual video/animation and comic strip, the Flash stories were intended to include sound effects and music. However, the Flash program proved difficult to work with so episodes became more arduous to produce. After Plastinate the idea was abandoned. Further Flash scenes were filmed for a Tom Baker story (which has still yet to be posted) and experiments have recently begun again on making entire episodes using Flash. The Autons first appeared in the Pertwee debut Spearhead From Space and were swiftly picked up for a rematch the following season in Terror of the Autons also featured the debut of The Master, companion Jo Grant and established the UNIT 'family' proper. 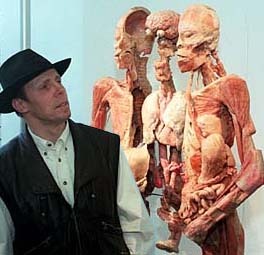 The Autons were slated to appear in Season 23 but the season was abandoned in 1985 when the show was placed on 'haitus' and later replaced with The Trial of A Time Lord. 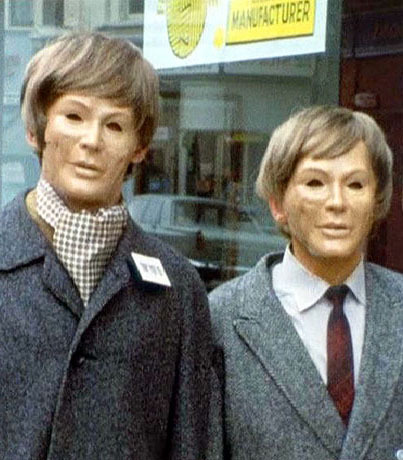 Nevertheless, the Autons proved popular, appearing in the fan made spin off Auton Trilogy in which UNIT battle the Nestenes once again, aided this time by the enigmatic Lockwood. 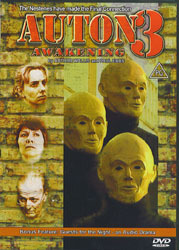 In 2005, the Autons were seen to burst out of shop windows (actually smashing glass this time) in the new series opener Rose. Plastinate doesn't have any continuity links with other stories. It takes place after Enlightenment (as there's no reference to the Black Guardian) but before The Five Doctors (because of the use of the old style TARDIS console.) I place it after The King's Demons. 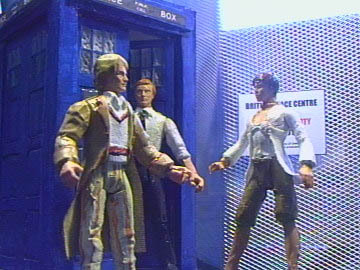 The Doctor's reference to UNIT as Department C19 is from Timeflight.